Salinas City Hall is located at 200 Lincoln Avenue, Salinas, CA 93901; phone: 831-758-7381. Photo: John Steinbeck House, ca. 1897, 132 Central Avenue, Salinas, CA. Listed on National Register of Historic Places in 2000. Photographed by user:Magnus Manske, 2008, (own work) [cc-by-3.0 (creativecommons.org/licenses/by/3.0)], via Wikimedia Commons, accessed August, 2015. For centuries prior to the arrival of Spanish soldiers and missionaries, and the establishment of the presidio at Monterey and missions at Carmel, San Antonio, Soledad and San Juan Bautista, the Salinas area was home to the Costanoan Indians. The Salinas Indians and Esselen Indians were also found in Monterey County. While the Salinas Valley remained generally unpopulated under Spanish rule, there were small settlements around the missions. Salinas was born after Mexico seceded from Spain in 1822 and began granting rancho lands to settlers. In the 1850s, two of these ranchos, the 6,700-acre Rancho Nacional and the 10,000-acre Rancho Sausal, formed the nucleus of what is today the City of Salinas. Named for a nearby salt marsh, Salinas has existed as a town since 1856. Salinas began as a cattle-raising center and, through the California Rodeo, the community pays homage annually to this western heritage. With its beginnings in wheat, barley, and cattle ranching, growth as a town began in the late 1860s when the fertility of the valley was publicized. Salinas became the seat of Monterey County in 1872, coinciding with the arrival of the Southern Pacific Railroad, and incorporated in 1874. In 1899, Claus Spreckels completed construction of the world's largest sugar beet processing factory and the sugar beet reigned from the early 1900s to the 1920s. Growing sugar beets for the huge mill at Spreckels (1899-1982) established large-scale irrigated agriculture. Also, by the early 1900s, dairies had become a major component of the valley's economy, employing newly developed condensing processes. During the 1920s, a major change in agriculture occurred with the introduction of lettuce and other row crops, including the artichoke. The development of ice-bunkered railroad cars made it possible to ship fresh produce nationwide, and lettuce soon replaced the sugar beet as the Salinas Valley mainstay. Construction of Reclamation Ditch 1665 in 1917 also had an effect on agricultural production in the area because construction of the ditch allowed marshland areas to be converted to farmland. The availability of electrical power also affected farming practices as electric power allowed farmers to extract groundwater, which allowed for a greater variety of crops to be planted and harvested, as the agricultural operations no longer had to rely solely on rainwater. The significant points of identification for Salinas today are its agricultural crops and the life and work of Nobel/Pulitzer Prize-winning novelist John Steinbeck. 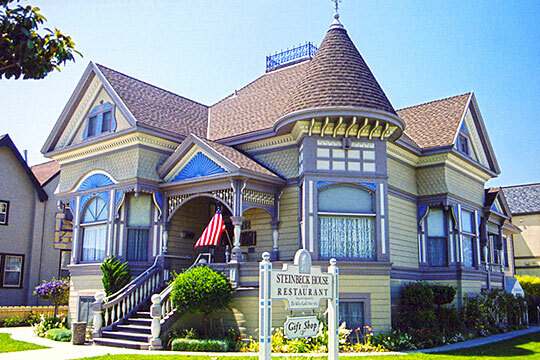 The community offers many attractions for locals and visitors, including the California Rodeo, National Steinbeck Center, Steinbeck House, California International Airshow, Mariachi Festival, antique fairs, and community festivals. With its rich heritage of ethnic and cultural diversity, Salinas has retained its western town image and its status as the dominant urban center in Monterey County. Salinas, seat of Monterey County, is still a cattle-raising center, as it was in the days when nothing stood here but the buildings of one of the Ranchose del Rey, where the stock of the mission at Carmel and of the Presidio at Monterey were pastured. The town dates from 1856, when Deacon Elias Howe erected the Half-Way House, an inn, store and county meeting hall. In 1869 Salinas had a population of 600 and the first newspaper in the section, the Salinas Standard, then a year old. Today its bustling modern business district is the market center for dairy farms, truck gardens and lettuce fields. The Salinas area has more than 50,000 acres in lettuce. In and about the town cluster the ice-making plants and packing sheds that prepare the crop for shipment to eastern markets. More than 2,000 field workers move in to plant, cultivate and harvest the spring, summer and fall crops. In 1936, when lettuce workers went on strike for higher wages and better working conditions, Salinas burst into the Nation's headlines as the scene of tear-gas battles between State Highway Patrol officers and strikers. Highlight of this strike was the mobilization which followed a report to the Highway Patrol that a Communist advance on Salinas was under way. Red flags proving the statement were taken from the highway and rushed to Sacramento. Airplanes were sent up to reconnoiter. Embattled growers prepared to defend life and property. In the meantime, an indignant highway commission request that the flags, placed as markers on roadsides by its workmen, be returned to serve their purpose of warning motorists. An unusual Salinas industry is the American Rubber Producers Guayule Plant, opened in 1931 with a daily production capacity of 15,000 pounds, which manufactures rubber for automobile tires from the Mexican guayule shrub. It was established here after 14 years of experimentation had determined that the valley offered proper conditions for raising the plant. Since 1926, 15,000 acres have been planted with guayule. After four years' growth the plant is harvested and its trunk and roots are cleaned, chopped and ground into fine particles. The rubber is skimmed from the fiber, refined, then dried and compressed. City of Salinas, CA, General Plan, 2002, www.ci.salinas.ca.us, accessed August, 2015.